Two creative foodies out to discover enticing flavours and food ideas. When we aren't tucking into our latest delicious find, we're photographing and designing our hearts out. Those in the know say breakfast is the most important meal of the day, so we thought we'd better head out and score ourselves a good one. And what do you know? 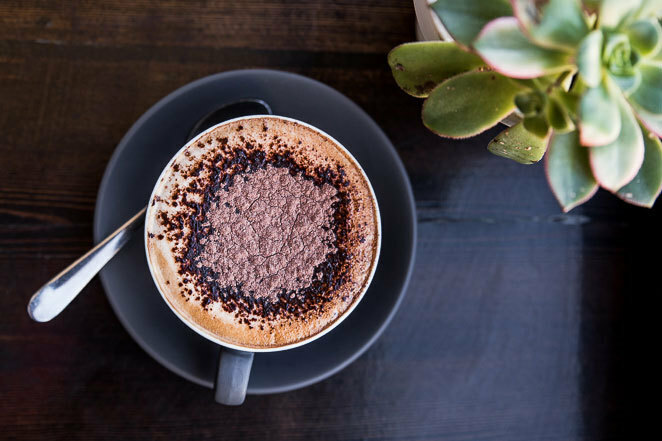 We ventured to Queenies Store in Largs Bay and discovered they have an All Day Breakfast Menu to choose from! All day breakfast at its best. 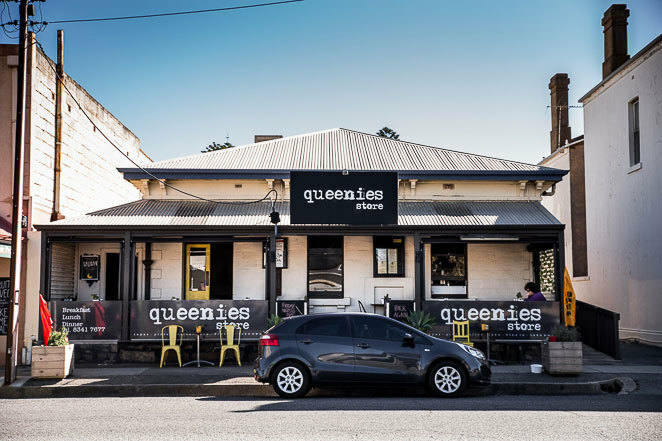 Queenies is tucked inside a historic building on Jetty Road, a stone's throw from the beach and Largs jetty, and right across the road from the Largs Pier Hotel. 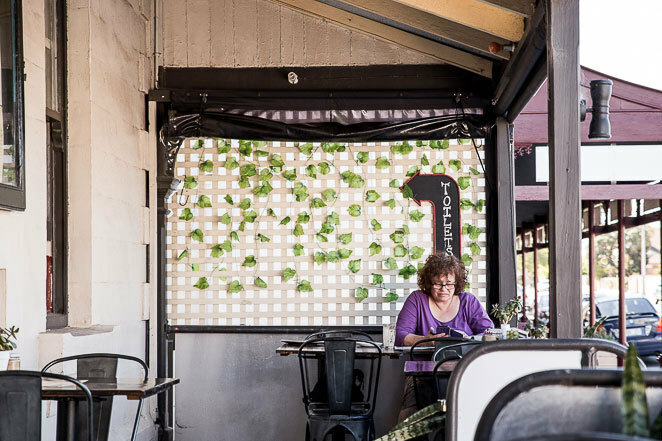 There's a lovely shaded balcony out the front, a sheltered dog-friendly verandah out the side where you can sit with friends of the two or four-legged variety, or you can sit at one of the hand-made tables inside and soak up some vintage ambience. But in the end, we couldn't resist going for the signature dish: The Queenie. 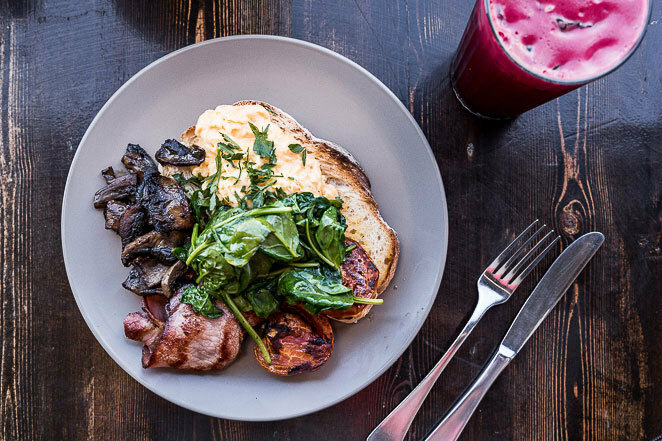 It's bacon and eggs like you've never had them before We'd heard so many good (read: delicious) things about it from friends and family, so were super keen to try it for ourselves. Let me just say, it did not disappoint. The Skara bacon had us 'mmm-ing' instantly with its crispy, slightly smoky bacon goodness, served up alongside scrambled eggs that were creamy, smooth and melt-in-your-mouth good. They were partnered up with the usual (and much loved) brekky suspects: grilled tomato, garlicky sauteed mushrooms, wilted spinach, and thick cut toasted ciabatta. With all those amazing flavours going on there was no need to reach for the salt and pepper. Order your food at the amazing vintage workshop counter. 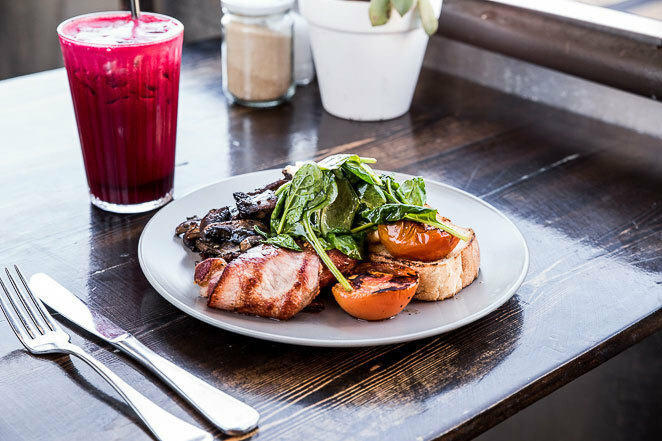 The Queenie was more than enough for the two of us, especially when washed down with a freshly-squeezed juice and a D'Angelo coffee each, but we wouldn't blame you for wanting a plate of this alllll to yourself. Gotta love that chocolate powder! But that juice though... what a combo! Beetroot, carrot, apple and Ginger. 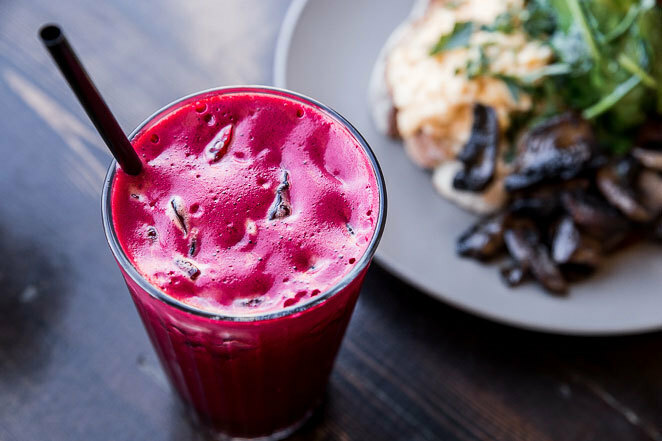 It was the perfect balance of refreshing flavourful subtly sweet, with an earthy flavour and gorgeous colour from the beetroot. So good. 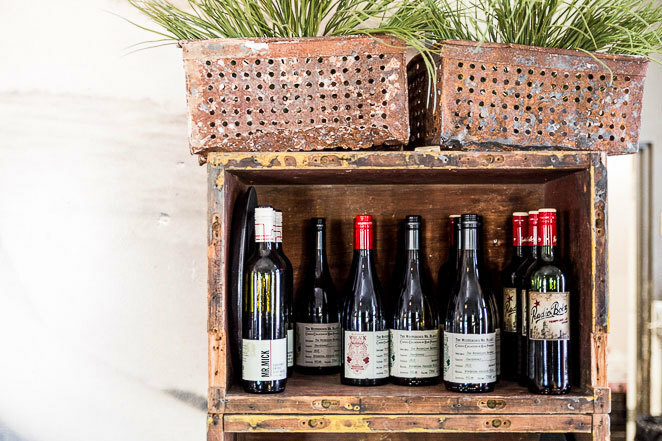 They've got a full wine/beer/spirits list too, if a cheeky glass is more your thing. It was great to see so many local labels on the list including The Mysterious Mr Black from the Barossa - just look at those awesome labels! For lunch, there's an awesome range of tapas, salads and burgers to choose from, ranging from $12 to $24. We actually shared the arancini balls on a previous visit with a friend and have been raving about them ever since. Grab a plate or two and share with a friend after a walk on the beach. Day made! Inside or outside, there's plenty of seating available. 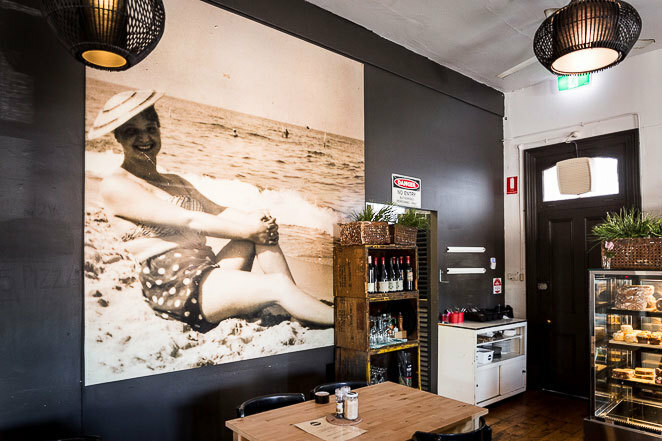 Speaking of tapas, Queenies is bringing back their Friday Night sessions over summer, where you can get epic tapas and pizza from 6pm and watch the sun go down over the ocean. Lunch or dinner, don't forget to bring the pooch along! 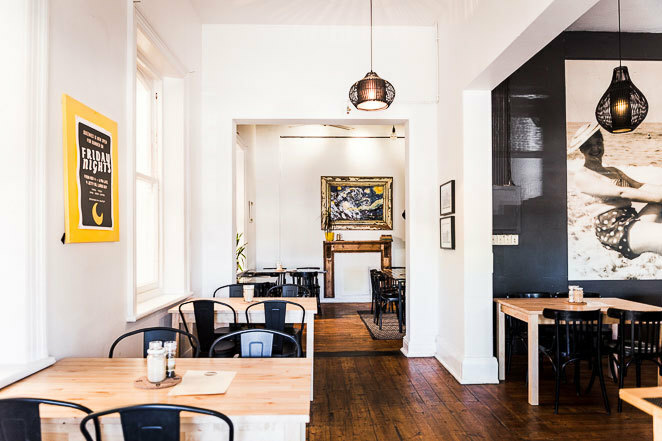 We had a quick chat with the lovely owner Lou, who told us that vegan, vegetarian and gluten-free options are available for those with dietary requirements. 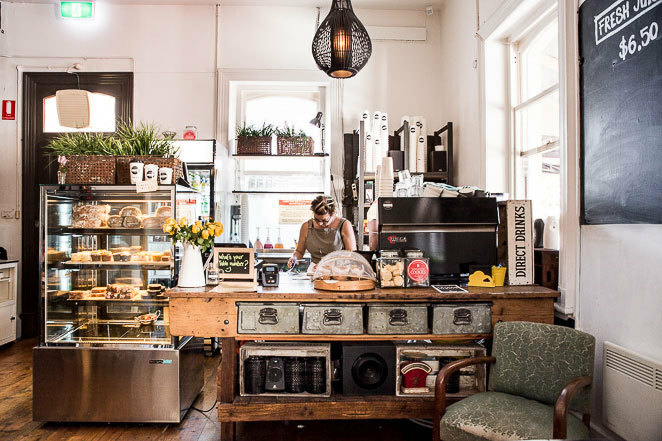 It was great to see so many locals popping in for a leisurely brunch or grabbing a takeaway coffee to see them through the day, and all were greeted like friends by Lou, Chef Billy and her friendly staff. P.S. Looking for the menu? Check out their Facebook Page for menus and updates. You know you're in the right place when you spot this! Why? Amazing breakfast, lunch and tapas by the beach. When: Tuesday to Sunday 8.00am to 2.30pm, Friday Night Tapas from 6.00pm over Summer. Unique decor, Laura - food looks delish too! The opening times stated in this article are incorrect. Queenies is closed on Tuesdays.